Chicago renderer BFT remains offered and unsold at $0.2700. Tech tallow remains quiet and the market appears to be well sold for the 30 day position. Choice white grease was lower out of the Mo. River market, $0.2300 – 0.2500. Indiana action was done in a range, $0.2450 – 0.2625. Biodiesel is active at the lower end of the range, while feed buyers are taking in material at the top. A need for CWG in the hog rations is helping keep those top levels in place despite the availablity of cheaper corn oil and yellow grease. The weekly average price of CWG Mo. River is shown against the average of the weekly averages of the Mo. 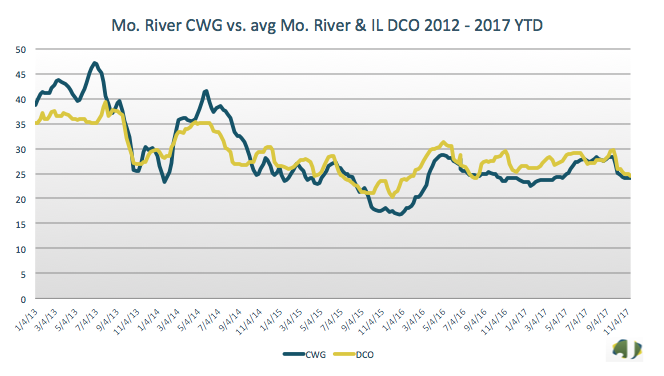 River DCO and Illinois DCO markets for 2013 – 2017 YTD. Corn oil traded as low as $0.2200 delivered Midwest today. Manly, IA action was reported $0.2500 – $0.2600 for Dec. Dec/Jan action in the IN/OH market was lower, $0.2600 – 0.2625 FOB. Yellow grease trading was lower out of the Mo. River market, $0.2150 – 0.2300. Soybean export sales for the 2017/18 marketing year were 1,104.8 TMT, down 5% from last week and 32% less than the prior 4-week average. Sales for the 2018/19 crop year totaled 72.1 TMT, lifting combined season sales to 1,176 TMT, which was within analyst expectations that ranged from 1,000 to 1,650 TMT. Combined sales were up 1.4% week over week. 2017/18 export commitments are 53% of the USDA forecast with 42 weeks to go. Current sales are 15% behind last year’s pace. Major purchases were reported for China, the Netherlands, and Turkey. Soybean meal sales for the 2017/18 marketing season were 163.1 TMT, down 49.8 TMT from last week and 26% less than the prior 4-week average. New crop season totaled 6.4 TMT lifting combined sales to 169.5 TMT. Combined season sales were down 20% week over week but within analyst expectations that ranged from 125 to 250 TMT. Accumulated export commitments for the 2017/18 marketing year are 39% of forecast. Major purchases were made by the Philippines, Morocco, and Japan. Soybean oil 2017/18 export sales of 2,700 metric tons were down 83% from last week and 32% less than the prior 4-week average. There were no new crop sales, leaving total sales at 2.7 TMT. Total sales were less than analyst expectations that ranged from 15 to 30 TMT. 2017/18 crop year commitments are 20% of forecast and 47% less than last year’s commitments over the same period. Major purchases were made by Mexico, El Salvador, and Guatemala. Weekly corn export sales for the 2017/18 marketing season of 949.5 TMT were down 60% from the week prior and 34% less than the prior 4-week average. New crop sales were 5 TMT, down 569.2 TMT week over week, lifting total sales to 954.5 TMT. Combined sales were within analyst expectations that ranged from 800 to 2,200 TMT. Increases were reported for Mexico, Japan, and Peru. 2017/18 export commitments are 42% of the USDA forecast. Export sales trail last year’s pace by 26%. Wheat export sales for the 2017/18 marketing year totaled 489,300 metric tons. Sales were down 37% from last week and 7% less than the prior 4-week average. New crop sales totaled 30 TMT, lifting total sales to 519.3 TMT. Combined sales are down 34% from last week but fell within analyst expectations that ranged from 350 to 800 TMT. Export commitments are 62% of the USDA forecast with 29 weeks to go. Export sales are 5% less than last year’s commitments during the same time frame. Major purchases were made by Japan, Indonesia, and South Korea.